I started by doing Improv at the LA Connection. I was about 24 and had never done anything like that. It was a ton a of fun. But more of a hobby at that point. In fact, like many improv groups, we had to pay monthly dues. 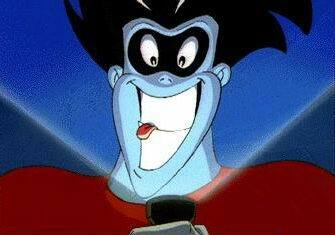 Paul provided the voice of Zany Superhero, Freakazoid. How did you get into the animation business? When did you first start doing voices? I was in a sketch comedy group called the Acme Players. 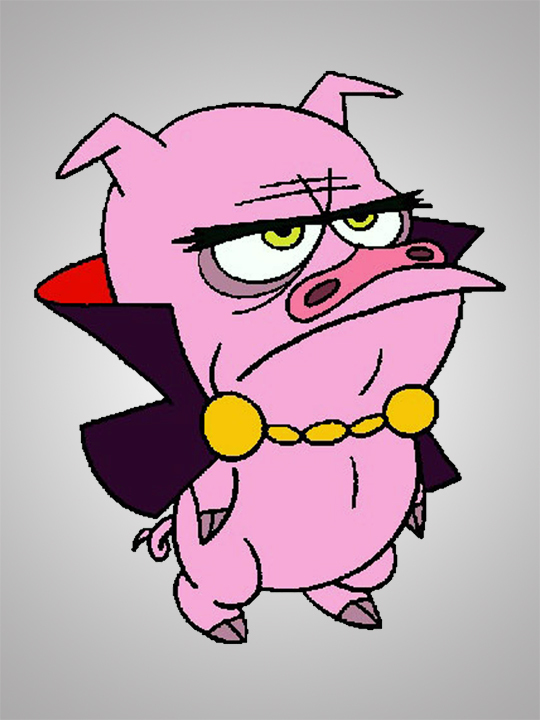 Our director’s wife was Sherri Stoner, who also happened to be the story editor on Tiny Toons. The Tiny Toons team had just developed Animaniacs and were looking around for writers. She gave me a shot at writing one. She also gave a script to fellow Acme player, John McCann. We both turned turned in our scripts at the same time and then went back to my place to eat cheap, powdered donuts, watch a bad 1950’s sci fi movie and ponder our relative destitution. About an hour into the movie, my phone rang and John and I were hired on the spot. It was a great day and I haven’t had a powdered donut since. What’s your process like for finding a voice for a character? Whatever’s I think is funniest, I guess. Which, by the way, isn’t always a view shared by others. It just depends. Sometimes it’s a voice that doesn’t really sound like it should go with the character. That always seems to work out best because it’s surprising. Animaniacs is still looked at as one of the best cartoons of the 90’s. What was it like working on the show? Do you have any memorable moments that stick out in your mind? It was great. It also happened to be my first real professional writing job. So, it has spoiled me terribly. It’s not the way things are done today so I look back on those days as being pretty special. Each writer would come up with a general idea for a segment. Nothing too planned out. Maybe it was as simple as, “In this short, Yakko, Wacko and Dot try to sell Einstein cookies.” And then a writer had about a week to hand in the first draft. I can remember rewriting and rewriting the opening page of each script until I thought I had come up with the right idea and once I thought I had hit it, it was super fun. There was a ton of freedom. That’s definitely not the way it’s done today. There are premises. Outlines. Revised outlines. Revised revised outlines. Revised revised revised outlines. Animaniacs was a speeding train and you just sorta had to hop and see where the heck it was going. It was a blast. "Flameel! Froynlaven!" Mr. Director parodied a certain "Comedic Genius"
The character of “Mr. Director” is obviously a homage and parody of Jerry Lewis. Was he written that way or was that something you came up with? I used to do Jerry Lewis impressions around the office and our executive producer, Tom Ruegger, thought I should write an episode with that sort of character in it. That’s how a lot of stuff on that show got made. Something would make us all laugh and Tom would encourage us to see if we could make it an episode. So, for that particular episode, I think the dialogue is pretty much exactly as I wrote it. Flameel and Froynlaven included. Besides being largely known as Freakazoid and Mr. Director you’ve done voices for shows like Scooby-Doo, Shaolin Showdown and Buzz Lightyear of Star Command. Are there any characters that stick out in your head that you enjoyed doing? I think my favorite voice was The Dark Lord – Chuckles the Silly Piggy in a short-lived show called Dave The Barbarian. I really loved that show and the recording sessions were insane. A lot of fun was had by all. 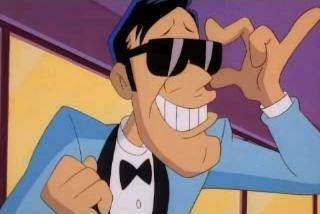 You were a writer and producer on Freakazoid, how did you end up voicing him as well? Well, we had written a few scripts and it was time to cast the voice. We auditioned a lot of great people. But, there was something missing and we couldn’t quite figure it out. We were really under the gun. Finally, Tom Ruegger told me to get in the booth and record some stuff. He encouraged me to do a lot of improvising and basically make an utter fool of myself…which I did. I thought it was going to be used to show the actors who were auditioning how we saw the character. But, he played it for Steven Spielberg. Steven liked it and said I should do the voice. Different writers have different techniques for finding inspiration. Is there any place or act that often helps you come up with ideas or end writer’s block? Music. Music and a legal pad. Sometimes just writing various things down in longhand slows the brain down long enough to find the answers I was looking for. I have a ton of movie soundtracks and I usually have that on in the background when I’m thinking. You were part of Puppet Up! Uncensored and now the Stuffed and Unstrung tour, what can you tell us about the shows, what they can expect and where they can see you? It’s pretty fun. It’s essentially an improv show…except with puppets. We like to say it’s two shows in one. The audience gets to see the puppets on large video screens. But, they also get to see the puppeteers on stage as they manipulate the puppets. Paul, pictured in the upper right corner, with the Puppet Up cast. You obviously have no problem doing funny voices so puppets seem like a good fit for you. How did you get involved with the “Henson Alternative” projects? I was invited to join the group when it was still just a Monday night workshop. I had written a pilot for the Henson company and they knew I had an improv background…so, with no previous puppet experience, I found myself standing in front of Brian Henson and the world’s best puppeteers. I’ve never been more nervous. But they couldn’t have been nicer. We did that workshop every Monday for about four months when Brian and our director, Patrick Bristow, decided to show everyone else what we had been doing. And thus…Stuffed and Unstrung was born. I have a pilot in development at Nickelodeon. I also am doing a voice in a new Cartoon Network show called, Secret Mountain Fort Awesome. It’s on Mondays at 8:30pm. I have a blog which is basically me just writing random bits of weirdness. I’d like to really thank you for taking the time to talk with us and hope the tour goes well for you and the rest of the performers! Good interview! I hope to see Stuffed and Unstrung soon. I was always hunting Puppet Up! clips, they were hard to come by.